This week's blog entry comes to us courtesy of Elizabeth Claire Dalton, a senior at F&M College, who has been working with a portion of the faunal collection from our excavations at Fort Hunter Park for an independent study. Thanks go to Claire for this week's TWIPA post. My name is Elizabeth Claire Dalton, a senior double major in Biology and Anthropology at Franklin and Marshall College working on my Honors Independent Study in Anthropology. I have been doing research with the State Museum of Pennsylvania’s Fort Hunter Collection, specifically feature 2-06, which we speculate was a refuse pit that dates approximately to the French and Indian War period. Fort Hunter was one of three in a chain of Forts established by the British in the mid-1750s along the Susquehanna River in preparation for the French and Indian War (Carr et al. 2007:53). The largest of these three forts is Fort Augusta and the other fort, larger than Fort Hunter, was Fort Halifax (Carr et al. 2007:53). Fort Hunter served as a supply fort for Fort Augusta, shipping them supplies via boat several times a month (Carr et al. 2007:53). Feature 2-06 was filled with faunal remains. The reason for the uncertainty surrounding the exact period of time during which this refuse pit was in use is the absence of datable artifacts. The vast majority of the bones have rodent gnaw marks, leading me to the preliminary conclusion that Feature 2-06 was a meat/animal remains refuse pit. Thus far, I have found some bones with saw and cut marks in accordance with butcher marks (Lyman 1977:68-70). Mostly the bones that have marks consistent with butchering are cow bones. Even if butcher marks are not present, it does not exclude the possibility that the animal was eaten. For instance, the remains of the three-year old horse do not have cut or saw marks, but this does not eliminate the possibility of the horse being used for food. In this collection, there are some bones that have spiral fractures, which might indicate that the bone was broken in this manner to allow for access to the bone marrow for stock for soup. The goal of my research is to examine what the dietary life was like at Fort Hunter for the soldiers and how this shaped their daily lives. My research is currently in its preliminary stages, but thus far the faunal remains have been primarily identified as domesticated animals. I have identified bones belonging to horses, cows, sheep, pigs, and deer, which is in accordance with the historic colonial sites dietary patterning (Jolley 1983:70). I have found a fair amount of horse and cow bones, some pig bones, and a few deer bones. At this stage in my analysis, however, I have only identified one sheep bone. For this analysis, I am calculating the minimum number of individuals, assessing age, tabulating cut/saw/defleshing/rodent bite marks, and with enough data, biomass estimation or meat yield. I would like to give special thanks to the Archaeology staff at the State Museum of Pennsylvania, Dr. Kurt Carr, Mrs. Janet Johnson, Mr. James Herbstritt, Mr. David Burke, and Mrs. Elizabeth Wagner for their help and support. I am also grateful to Zoology and Botany Curator Dr. Walter Meshaka for allowing me to borrow part of his skeletal collection and sharing his birthday cake with me. I want to extend my thanks to Dr. Mary Ann Levine, Associate Professor of Anthropology at Franklin and Marshall College and my advisor, for all of her help guiding me through this research and sparking my interest in archaeology in the first place. I would not be where I am today without you, Dr. Levine. My sincere thanks go out to Dr. Teagan Schweitzer of the Department of Anthropology at the University of Pennsylvania and Dr. Kirk Miller D.F. Fackenthal, Jr. Professor of Biology, Franklin and Marshall College for allowing me to take pictures of their skeletal collections and my parents who, bless their souls, helped me amass and clean my comparative skeletal collection. If you have any questions or information that you would like to pass on to me, please feel free to email me at edalton@fandm.edu. Finally, before we go this week, we invite you to join us at the State Museum on Sunday the 27th for the much anticipated opening of the newly refurbished Paleontology gallery on the third floor, featuring the permanent installation of the Marshall's Creek Mastodon in its new surroundings. From Noon until 4 PM, curators and docents will be dispersed throughout the Museum's galleries to interact with and engage visitors for what promises to be an informative and enjoyable event. 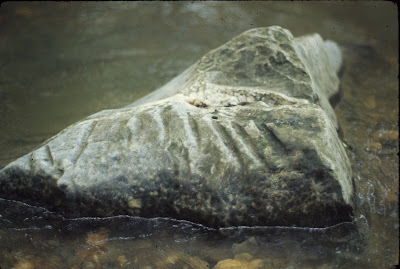 Multi-grooved stones of various sizes and shapes have been found on Late Woodland and early Contact period sites in Pennsylvania and throughout the East. Although several hypotheses have been proposed, there is no agreement as to their function. These objects are thought to be involved in abrading, honing and sharpening although it is not clear as to the kinds of material that were being abraded, honed or sharpened. One unusual form of a multi-grooved stone is a “sinuestone”. 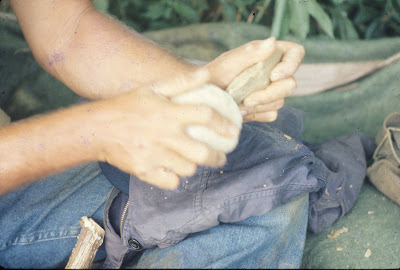 With the exception of the large Susquehannock arrow shaft polishers at Washington boro, Pennsylvania (Witthoft 1959), these grooved and multi-grooved stones were small, hand held and easily carried tools. Most often multi-grooved stones were made from cobbles of siltstone and fine grained sandstone that were readily gathered from nearby stream beds. One exceptional example in the State Museum collections is a small celt of granite that has numerous multi-directional grooves on its long axis, many of which are extremely well worn and somewhat polished. One might conclude from these observations that such grooves were formed by repeatedly drawing strips of dried rawhide over the stone’s surface. The process would easily render sun cured leather into a more acceptable material from which to make clothing. A similar procedure may also have been used to process plant fibers to make cordage, rope etc. On specimens where the grooves are more multi-directional than parallel, and appear more abraded and battered than smoothed and polished, their function is likely related to making stone tools. Using these tools, it was possible for the flint knapper to prepare and/or roughen the margins of a biface, thereby allowing for successful removal of additional flakes when making an arrowhead or re-sharpening one. 1973 The Parker Site: A Manifestation of the Wyoming Valley Culture. 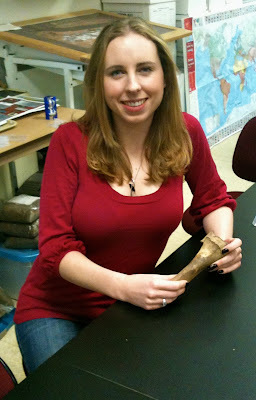 Pennsylvania Archaeologist 43(3-4):1-56. Although the vessel was in surprisingly good condition, and is the only one of its kind in the Archaeological collections of The Pennsylvania State Museum, it was not associated with the brick foundation. 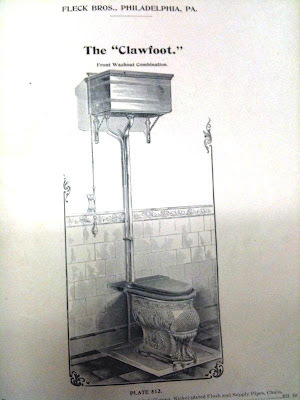 It was instead a very ornate and early toilet. 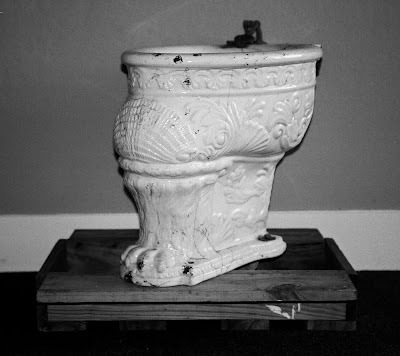 The toilet’s maker’s mark shows that it was manufactured at the Trenton Potteries Company of Trenton New Jersey in 1902. This date suggests that it was added towards the end of the Cresswell’s occupation of the home. According to the historic record, Robert Cresswell leaves the property to his wife Elizabeth in 1892 and by the time of the 1900 census it appears that she may have taken boarders into the home. Although she retains ownership of the home at 1327 Arch Street until 1910, research indicates that she no longer lives there after 1900. If Mrs. Cresswell owns the home in 1902, then she must have installed the toilet. The trouble with this hypothesis is that the home was used as a boarding house from about 1900 thru about 1920. It doesn’t seem likely that this highly decorative toilet would be installed for working class boarders. Which begs the question where did it come from and why is it here? As is often the case in archaeology, the closer we think we are to the answers, the more questions we actually raise. We did some research on toilet manufacturing and contacted some vintage bath fixture shops (Historic Houseparts, Inc. and Vintage Plumbing) and they were able to supply us with some specifics on our toilet. What we learned is that this particular toilet is a front washout style bowl, this was one of the earliest and most “primitive” ceramic toilet bowls invented. It has not been sold in the U.S. for about a hundred years and is now only found in a few places in Europe. This design would have most likely used a pull chain attached to a tank that was mounted on the wall above the toilet. 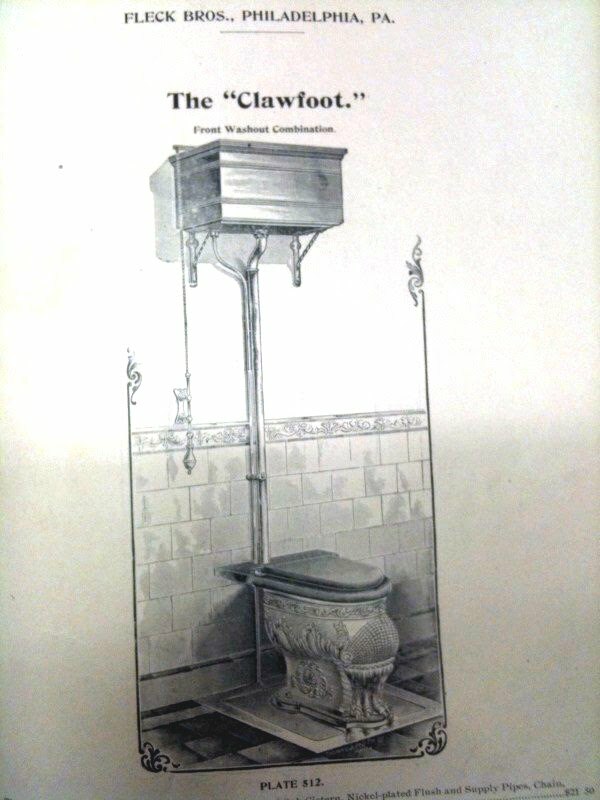 The plain undecorated version of this toilet would have been a very common and inexpensive style at the turn of the 20th century, exactly what we would expect to find in a boarding / tenement setting. The heavily ornamented embossed bowl would have been reserved for the upper class. They were the people that were more inclined and able to spend the money on high style. 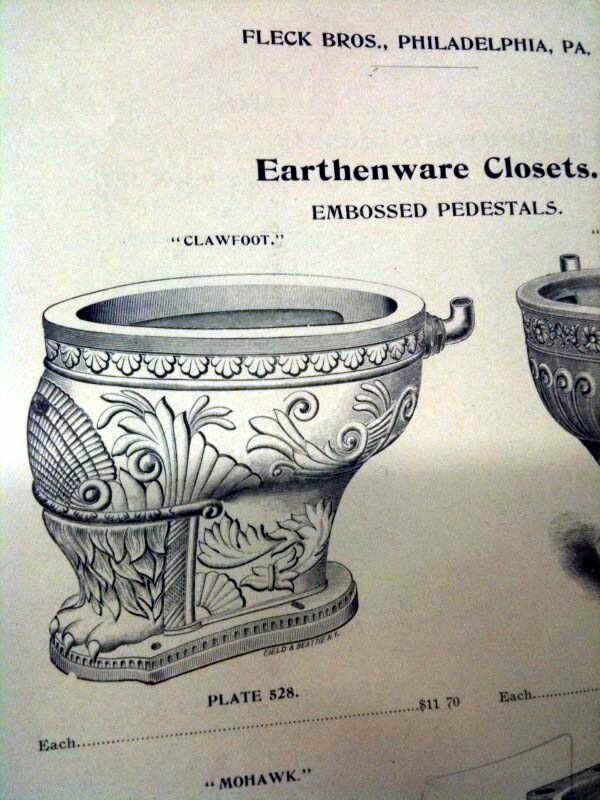 During the Victorian era people of means surrounded themselves with ornately decorated homes and objects, even in the bathroom, and this particular design “was one of the most creative”. The claw foot was a very popular motif on all things from furniture to bathtubs. It is quite possible that this design was manufactured specifically for Fleck Brothers Manufacturing Company; their 1899 catalog depicts a similarly ornate bowl. Fleck Brothers was located at 50 North 5th Street in Philadelphia so it would have been accessible to the Cresswell’s. 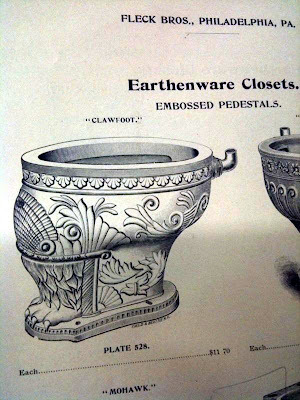 Mrs. Cresswell had the means to install fine furnishings in the home, but why she would spend the additional money on an ornate toilet over the plain toilets typically installed in boarding homes is a question we can not answer. Is it possible that she loved this home that she had lived in for nearly fifty years and wanted to outfit it with fine furnishings? The transition to working class neighborhood was just beginning- was this an attempt to retain civility and status in her home? Can you relate these questions to your own human behavior and inclinations? It was once considered a very taboo topic to discuss sanitary disposal or even acknowledge such basic human practices. Anyone that dared to “study” such subjects was seldom taken seriously and more likely to be considered deranged. Perhaps that is why the knowledge of waste removal has come and gone so many times throughout human history. From as far back as 2500 B.C. the Harrappa civilization in what is now India, had cities that were laid out on a grid with sewer drains under the roads. The Crete’s and Roman’s also had water born waste removal in their cities. As the study of man, i.e. Anthropology has evolved to consider ALL aspects of human behavior we have found much value in studying even those objects we once took for granted. The artifacts left by those before us, be it during pre-history or the historic period are the physical evidence of lifeways often undocumented and lost to history. These traces of who we are provide archaeologists with the connection to what matters to individuals and societies and helps anthropologists predict changes in society. Reflect for a moment on the transformation of socioeconomic levels of these occupants of 1327 Arch Street in Philadelphia during the transition from the19th to 20th centuries at the height of the Industrial Revolution. Featured periodically in our blog are collections produced as a result of archaeological investigations conducted by contract archaeology firms. A recently received collection was the product of an investigation and subsequent excavation undertaken prior to the expansion of the Pennsylvania Convention Center in Philadelphia. John Milner & Associates (JMA) conducted this investigation between early May and late June of 2007 in center city Philadelphia. The resulting collection produced from this project includes a wide array of historic ceramics, glass and personal effects that are the physical connection to many of the peoples whose toils led to the early industrialization of Philadelphia. More importantly they represent a working class of peoples often not represented in historic documents, but whose legacy continues through the refuse they left behind. Historic background research conducted by JMA identified early residents of the neighborhood on Arch Street, where we will concentrate our discussion, as professional and middle-class. The surrounding businesses and residents were comprised of physicians, a silver smith, brick yard, cigar maker, boot & shoemaker and numerous other artisans. This homogenous mix was a reflection of the immigrants settling in Philadelphia and an important foundation in the development of the city. The transition of this neighborhood from a mix of professional and skilled labor to one of industrial and commercial establishments is reflected in the wares recovered from this archaeological investigation. Our focus this week will be on the residents of 1327 Arch Street. Research of deeds and census records for the property records it as early as 1783, with multiple owners. Of note in this deed trail is John Hinckel a city potter on record in 1792 as owner of the property until 1851. The first deed record of a residence at this location was in 1853 when Robert Cresswell purchased the property containing a “four-story messuage”. JMA describes the residence as a long narrow 4-story brick building with a narrow open yard. Cresswell’s occupation is a merchant before becoming a wallpaper manufacturer. Census records indicate the Cresswells lived in the home until the late 1800’s when Robert’s will transfers ownership to his wife. The neighboring residences also undergo a change in occupation and by the turn of the century the middle-class have moved out and are replaced by the working class. Residents of the house include individuals listed as renters and boarders. Their occupations range from mailman and clerk to servant. Included in the list of residents are three black servants. The census and deed records document the frequent change in residents and the change in ownership over the next forty plus years. The Creswell’s home transitions from a large private residence to the Hotel Lenox in 1925 which operates for about ten years at this location. 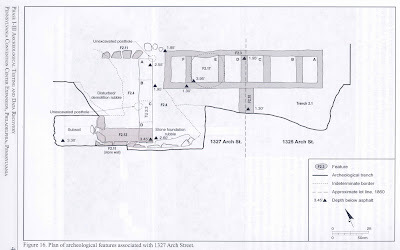 JMA’s excavations of this house lot documents numerous archaeological features including a midden, builder’s trench, and a brick foundation at the rear of the property. Archaeologists from JMA observed both intact and disturbed portions of the property as a result of demolition and construction projects on the lot. Investigations at 1327 focused on two primary features; the midden commonly known as a trash/refuse pit and a brick foundation. 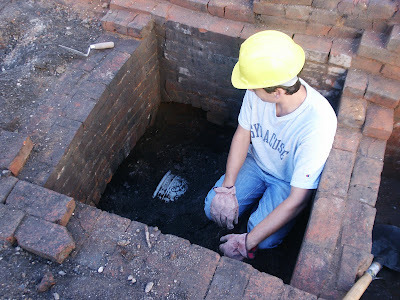 Located adjacent to the brick foundation was a deposit identified through observation of soil changes during excavation by archaeologists as an undisturbed remnant of yard. JMA also noted changes in the soils around the brick foundation and observed construction trenches which cut through the surface. Further confirmation came from the artifacts found within this unit. Ceramics, glass and dietary waste recovered from this unit indicate activities on the property prior to the first recorded residence in 1853. Included in the refuse were fragments of slip decorated redwares, pearlwares, kaolin pipes,clam and oyster shells, along with beef, pork, chicken and turkey bones. Also recovered by archaeologists were fragments of saggers and a waster. Both of these items are often products of kilns and pottery manufacturing. Saggers are large, thick walled clay vessels that protected the pottery while it was being fired. Wasters are ceramic pieces that were damaged in the firing process and may have broken or were unacceptable for some other reason. Recall that deed records indicated that a potter, John Hinckel, had owned the property prior to the first recorded occupation of the lot by the Cresswells. The address for his shop is recorded at South 7th and 8th Streets on Market Street in a 1791 census. Historic documents for the development of Philadelphia indicate that Arch and Market streets became the desired areas for the middle class at the turn of the century. While the background research does not document Hinckel residing at 1327 Arch Street, the artifacts recovered indicate he either resided here or possibly operated a pottery at this location for a period prior to selling the property. Research does not indicate if Hinckel was a redware potter, but Philadelphia is long known for its German redware potters. Historic ceramics excavated from Feature 2.4, slip decorated redware on the left and decorated pearlwares on the right. If Hinckel occupied this location for a period of time, might other structural evidence be buried under the debris encountered by JMA archaeologists? Investigations continued to focus on this lot with excavations of a multiple bay brick foundation adjacent to the now excavated midden. This foundation was just over 17 feet long and approximately five feet wide. 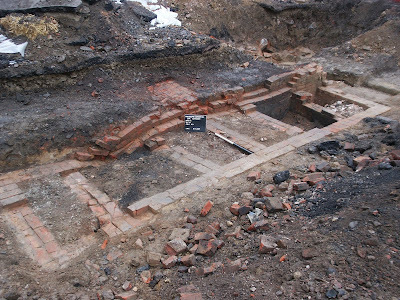 Excavations of this feature revealed a series of five chambers filled with demolition debris and ash. Archaeology revealed that this structure was shared between the residence of 1327 and 1325 Arch Streets at the rear of the residences. In the upper layers of ash fill the top of a large ceramic vessel was unearthed and the prospect of answering the occupation questions encouraged JMA archaeologists involved in the project. Would this vessel help to date the foundation and was it contemporary to the intact yard surface? If we are known by what we leave behind- in either our material culture or our personal deeds what other evidence of the occupants of 1327 Arch Street might an investigation of our remaining feature provide?